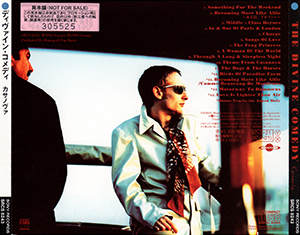 Since 1996 The Divine Comedy’s album have been edited in Japan. Mainly because of the success of Casanova. So, a deal was set up with Tristar (branch of Sony) to release the album in Japan. The release was followed in 1997 by Japan releases of A Short Album About Love, the reissues of Liberation and Promenade and a promotional compilation, The Divine Selection. As (nearly) all Japan releases, this edition of Casanova comes with bonus tracks, an obi strip and an insert with additional notes on Japanese. The bonus tracks are actually the new songs among the Casanova B-sides: ‘Birds Of Paradise Farm’, ‘Love Is Lighter Than Air’, ‘Motorway To Damascus’; as well as ‘Comme Beaucoup De Messieurs’ the French version of ‘Becoming More Like Alfie’. The choice of this song is original and a bit of a surprise knowing that the song was produced by French label Labels and not by Setanta. We can notice that the song is tracklisted as ‘Becoming More Like Alfie / Comme Beaucoup De Messieurs’ and notes in Japanese appear for this song and for ‘Becoming More Like Alfie’. On the back we can find at the same place as the UK release the barcode and the track. Under the barcode we can read the serial number ‘SRCS 8243’. Under the track, we can spot copyright mentions as well as a Tristar logo. Down left there is still the Setanta logo, and down right we have an additional Compact Disc Digital Audio logo. The right side is similar to the UK edition (red titles on a black background) but with the japanese serial numbers at the bottom and a blue round at the top. The left side is different this time: there is a white background with the title in japanese printed in black, but still with the serial numbers and a blue round at the top. At the back of the booklet under the photos there is a Tristar logo. And, at the bottom of each page the serial number ‘SRCS 8243’ is printed. The number is even printed on the background picture under the CD ! The element of interest of this Japan release is mainly the obi strip. With nice colors it features many artwork elements of the album. First, the background features the photo of Neil Hannon drinking his coffee in Venise. Over it are printed the titles and a frame about the 3 singles of the album. Below there is an ashtray (as a reference to the cigarette stuck in Neil’mouth) and a rose (cut on the 2 parts of the obi strip) that could be the one used for the CD artwork. We can notice that the other Tristar release does not use, as a Divine Comedy logo, the ashtray but the coffee cup (en référence à la photo) with the mention ‘The Divine Selection’ (as the disc of the same name). Maybe it was decided that the coffee with less dangerous than the cigarrette ! The side of the obi strip has the names of the band and the album both written in Japanese (like on the CD box). For the little story, on the Japanese edition (Tristar) of the tribute album The Smith Is Dead we have an advert for Casanova on the obi strip. Once unfolded, the sheet that comes with the booklet is made up of 4 pages. The first one hold the tracklisting and an article in japanese, the following ones the lyrics of Casanova in japanese, and then the bonus lyrics in english (or in french for ‘Comme Beaucoup De Messieurs’) and in japanese. On the last page appears a couple of mentions, and on the top of each page is printed ‘SRCS 8243’ (not visible on scans). Along with the sheet is a postcard about Tristar. This postcard looks like a consumer survey. On this one, the serial number ‘SRCS 8243’ is found again. The Japanese releases of Divine Comedy’s albums also turned out in promo version. However, those promos are different than the European ones. It is an ordinary album, and not a CD-R or a CD in a card sleeve. It is indicated as being a promo with the mention ‘SAMPLE’ is graved on the CD slice.